WOW interesting thread. Now 7 years after the introduction we are starting to really see what these cars are made out of. Keep sharing your knowledge. No cutting. We took it all apart which took about five hours. I would pull the upper vacuum actuator off the turbo, should be less than an hour. I guess I was lucky since it rattled Pictures show the internal repair. Is it the true solution, I am not sure it but I have about 800+ miles on the fix and it is running better than it had for awhile. So for me it seems to be the fix. I think ltcjim did find the true cause of this P2263 code. It is definitely not the solenoids since I replaced all 3 on mine and it is still throwing the code. I haven't had time to look at the car yet so not sure if the diaphagram/actuator can be removed without pulling the whole turbo. I really hope ltcjim is right and the diaphagram/actuator can be removed without pulling the turbo. I just wish Acura would sell the damn part separately instead of having to do this kind of fix. Too bad our vehicle don't have the strong AM support other vehicles have. Otherwise, this would be a good oppurtunity for a turbo upgarde. I guess I'll keep it to 120k miles (currently 75k) and then get rid of it. I gave up and traded it in for a new 14 Ridgeline SE. I will be putting all the parts on the black market such as IC and ATLP exhaust as well as a lot of stock accessories. Nothing like a new car with a warranty. Well I have a little over 2000 miles after the repair and she is running good. Do you have nay more pics/descriptions of the process? Mine has been acting weird and I plan to tear into it later this spring. I just want a better idea of what it solved, and how long it will take. I assume just about everyone will need to address the acuator sooner or later. In hindsight is there a better way to do this? Sorry I do not have any more pictures. It was an afterthought to tell the whole story. That said I purchased and downloaded the "ALLDATA" for the RDX and followed the instructions to pull the turbo. It took me and my son about five hours to pull it. To remove the turbo you have to clear out the top of the engine compartment. I believe there is enough clearance to pull the vacuum actuator without removing the entire turbo if that is the problem. If you shake the actuator and it rattles then you probably have the same problem as I did. If you do carefully pry open to vacuum actuator to get to the diaphram. It opened at the seam but was not easy. We used 1200 degree JB Weld to seal it back up and it seams to be working. I hope this helps. I plan to pull the acuator in a month or so. Can you describe how the car was driving before and after? I know I am overly sensitive to how my cars operate and wonder if I am over scrutinizing it,or if something small is wrong. A turbo would be a big problem, but an acuator,not as much. I bought the RDX with high miles and had no real frame of reference on how it should act but the turbo guage would hit max as I accelerated and stay they until I let off the gas or achieved the desired speed. There was no middle ground. When the check engine and the AWD lights came on I was at speed on the highway and did not notice anything before it failed. Since I have repaired it the boost guage displays boost throughout the guage range and she drives well. My 2009 Rdx Lit Up With This Code And And The Sh-Awd Code 77. It's At The Dealership Now And They Came Out With A Ripped Hose That Is About 4 Inches In Diameter, Short AndElbow Shaped. It Will Cost About $150 To Replace But They Don't Have This Hose I In Stock So They Gave Me A 2014 ILX Loaner. I'm So Relieved Because I Was Afraid I Would Need To Replace The Turbo For $4500 Like I've Read OthersTalk About On This Forum. I'm Thanking The Car Goddess That I Lit A Candle To Last Night!!! After your repair, a part number (for the hose) from your invoice would be of interest to myself (and probably others), since that would allow looking up the part on a parts diagram. Any idea how the hose got *ripped*? worn, damaged, rotted, etc??? That sounds like the intercooler inlet hose(connect turbo outlet to intercooler inlet). I can see that hose failing due to the constant exposure to heat and compressed air. If that hose did fail though, it should have made a pretty loud noise while the engine is under boost. I still haven't had a chance to try and take that diaphgram/wastegate actuator off to see if that is causing my P2263 error code but the weird thing is I haven't been getting that error code recently so not really sure what to think at this point. I finally had some time to pull the diaphragm off the turbo and try to figure out why I keep getting the p2263 error. I think the part that caused me to have this code is a piece of metal that connects the diaphragm arm to the wastegate actuator arm. Originally I thought maybe my diaphragm had the same issue as ltcjim's where a piece broke inside. But after I removed the diaphragm I shook it and it did not make any noise. I then proceeded to hook up the diaphragm to a vacuum pump to test it. I was able to verify that the once there is vacuum, the arm did not move easily. If the piece was broken inside, it should move very easily and you probably wouldn't be able to hold any vacuum. I then applied some positive pressure and verified that the arm moved down and was still not able be be pushed very easily. After that test, I concluded that the diaphragm is still working ok and figured my problem is something else and most likely I was going to need to replace the whole turbo. Then, before I put the diaphragm back I was looking at the piece that connects the diaphragm to the wastegate actuator arm and it looked kind of odd to me for some reason so I took a closer look at it. 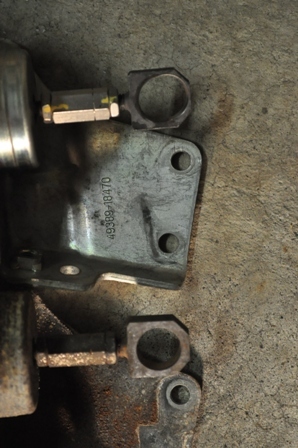 It is a square piece of metal that connects to the turn buckle on the diaphragm arm and it has a round hole in it that connects to the wastegate actuator arm. In my case, the hole was so worn that it was no longer round and more like an oval. So looking at that and thinking about how this turbo system works, I thought that the most likely problem is that the worn piece of metal is preventing the diaphragm from holding the wastegate completely closed when it should be closed and the ECU is sensing this, thus throwing out the error code. Basically, I think the way this system is supposed to work is while the engine rpm is low and exhaust gas flow is low the diaphragm keeps the wastegate closed. Then as engine rpm increases and exhaust gas flow increases, the diaphram gradually gets positive pressure and opens the wastegate. For my car, I think what was happening is that when the diaphragm is getting vacuum and trying to keep the wastegate completely closed, since the metal piece is worn, it has some play which is allowing the wastegate to open slightly and the ECU is sensing this and throwing out the code. All I did to try and fix it was I shortened the turnbuckle to adjust out any play on the wastegate actuator arm and made sure that while there is any vacuum applied to the diaphragm, the wastegate is completely closed. My RDX has about 130K miles on it and the p2263 code started happening around 115K and has gotten more and more frequent. It has gotten to the point where every time I drive it, the light would come on, then most times it would shut off after a while then come back on. I have put about 600 miles on the car since I did the adjustment and so far it hasn't thrown any codes yet, knock on wood. I have a code reader and I've been reading the code and I do see that the p2263 still happens every once in a while but it is not triggering the CEL light yet(You need to have multiple instances of this error condition before it'll throw the code. Conversely, if conditions are right and there is no error, it'll remove the existing "pending" error code. I think that is why the light comes and goes). So to make a long story short, in my case, all I had to do was adjust the diaphragm turnbuckle to fix the problem. With that said though, it was a major pain to remove the diaphragm without pulling the turbo since the turbo is buried in the back of the engine and it was very very difficult to get to it. Might be easier to just pull the turbo. Also, I view my solution as a temporary fix, if the metal piece keeps wearing like it has been, its eventually going to break the metal piece since there is not a whole lot of material left. I'm really hoping Acura starts selling the diaphragm and turnbuckle assembly separately instead of having to buy a whole new turbo since the turbo itself still seems to work fine. Anyway, I will update this thread again if anything changes or if I start getting the p2263 code again. Oh and I forgot to mention, I think it would be possible to do a quick check before you go through the trouble of trying to take the diaphram off. With the intercooler removed find the actuator arm that operates the wastegate flap(its the diaphragm that is oriented vertically with the arm going up and down), you should be able to get to it from the passenger side. Try pushing on the arm to see if you can push it down while everything is hooked up. If the wastegate arm moves easily(and you don't see the diaphragm arm moving), most likely you have the same problem my car had. If you see both the wastegate arm move and the diaphragm arm move, then you might have the same issue as ltcjim did. ... It is a square piece of metal that connects to the turn buckle on the diaphragm arm and it has a round hole in it that connects to the wastegate actuator arm. In my case, the hole was so worn that it was no longer round and more like an oval. Is it possible to lubricate that hole? is there any access to that part/ hole without pulling the intercooler? so that periodic lubrication could be done? 1) It is basically bolted to the hot side of the turbo so gets really hot. 2) Its not very accessible so I was afraid putting grease there would attract dirt which might actually make things worse. Just curious, any record of this happening on anything other than an 07-08 RDX? Obviously higher mileage, older models would be more prone to general part failure from age and wear, but there are tons of 9-12 models over 100k by now as well. Wonder if it affects potentially all RDX or only the early ones. 07 RDX bought new and always maintained in my own garage. At 140000 miles now with no turbo issues at all. 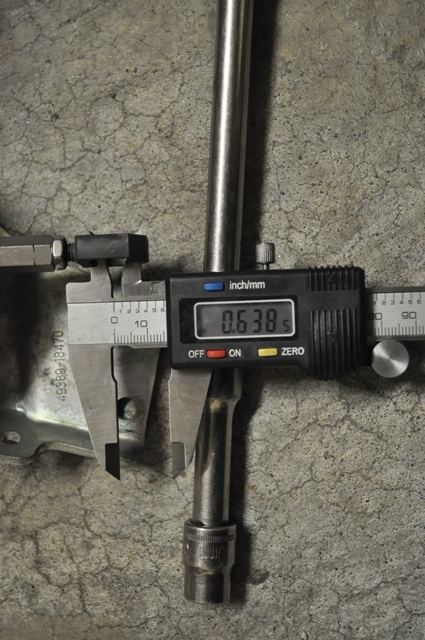 The various turbo system hoses still check ok.
A common method of addressing a worn (oval) hole, is to drill (machine) it slightly larger (and round), and insert a (thin) machined bushing. Since I cannot see this area on my own RDX, I do not quite understand how the attachment using that hole is made. But possibly a bushing would not need fixing in place, or perhaps just *staked* in place - or spot weld. Of course, that would require another disassembly - and some down-time for machine work. Just a thought if you wish a more permanent *fix*. It's just a piece of square metal with a big hole in the middle and screw threads on one side to thread into the turnbuckle on the diaphragm. It would be easy to just replace the part. Problem is Acura doesn't sell any parts for the turbo separately. You have to buy the whole turbo assembly for this 50 cent part. My 2007 Tech with 120k on it threw the same two codes today: SH-AWD 77 plus Engine P2263. I pulled the inter-cooler to replace the plugs a few weeks ago and have notice an air/vacuum whine ever since. Last night I replaced the air filter. I'll check the hoses, etc tonight or tomorrow for leaks and post my findings. Thanks for all the previous posts! Well, my fix, while embarrassing, was easy. When I re-installed the inter-cooler after my plug change I 1) left two hose clamps loose and 2) did not properly orient the front hose so it was not aligned and therefore not properly sealed. Thanks to all who have posted about the dual SH-AWD/Check Emission error combo! You probably saved me a $100 mechanic visit. ^^^^WOW - I can actually *see* the wear, in your first picture, between the two different parts. Where did you obtain the used replacement? I would have thought that a wrecking yard would not allow pulling a part from the turbo unit, but would want to sell the turbo complete. Just wondering - and thanks for the pictures, very instructive. Odd that there is no provision for lube or other wear prevention. What about the connecting part, that inserts into the worn hole? 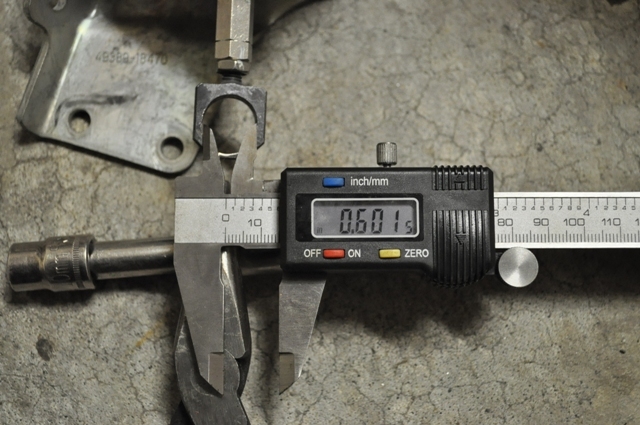 is that part also worn, and by how much - just an estimate would be good, not an actual measurement. Last edited by dcmodels; 08-21-2014 at 04:54 PM. the connecting seem to be harder metal and is not effected. The turbo I bought was on ebay for 150bucks. Thanks for the pics. My looks exactly like the one on the top of your first picture! After replacing yours, are you still getting the Check Engine Light? I got about 800 miles before the light started coming back on with a vengence. I then took the thing off again and shortened it some more so that it is tighter. I also put a light coat of high temp brake grease on the metal piece and the shaft. Its been about 600 miles and so far no codes and no lights so I'm cautiously optimistic that this time the fix will be good for a while. I think eventually I'll need to go find a junkyard turbo to salvage parts or have one made to replace this one. No code, i have driven the car hard for the 1 week and still no code. The turbo pick up faster then before. With my old diaphragm i used clear it and 2 min later drive the light will come on. When need a hard metal or a bushing. ^^^^When need a hard metal or a bushing. Thanks again for the pictures, now that I know what to look for, I *found* the part immediately - I was previously looking on the driver side, and the diaphram and wastegate arm attachment is actually on the passenger side, just behind the engine valve cover and easily seen. In fact, it seems possible to spray a bit of lube into the linkage-hole in the diaphram arm. I wonder if some motorcycle chain lube w/ molly would work? to help slow any wear of the *hole* in the linkage arm? the chain lube grease would evaporate from the heat, but the molly should remain. There should be nothing left to attract dirt. If I try that, I will report back. Last edited by dcmodels; 08-26-2014 at 12:42 AM. My car is a Northern California car. I'm the second owner. Bought it from my brother who bought it new. While he had it, he always had it serviced at the Acura Dealer. I'm guessing a lot of high mileage RDX are going to be susceptible to this issue. If it's 200 bucks it sounds like they're replacing the re-circ valve that's attached to the intercooler. I can't see them touching anything on the turbo that cheap considering the labor involved in removing it. Good luck though, and share what you find out! Unless Honda/Acura starts selling that part separately I think the dealer will have to replace the turbo. But yes, please keep us updated on what they do as a final solution. I finally bit the bullet and bought a lot mileage turbo off ebay and had mine replaced. It looks like my turbo had the same problem with the metal coupling wearing on the variable flow actuator. So I probably could have just replaced the actuator. But the turbo I bought was from a car with 10k miles. So I just replaced the whole thing. Did not feel like messing around. $500 for the turbo and $950 to replace it and adjust the valves. I believe I solved the problem with my turbo. My son and I pulled it and as stated earlier it received a clean bill of health. Next we checked the actuators and the variable venturi actuator had a rattling noise. My son proceeded to open it. He discoved that the post that goes through the diaphram has a washed holding it in place. This washer had seperated and caused the actuator diaphram to not operate and in turn the venturi would not open and all the boost went out the waste gate. He took the pieces and had the washer tack welded to the post. He then closed it back up and used 1200 degree JB weld to ensure it was sealed. We test drove it and I have noticed a difference in the turbo boost profile. I bought the car with 90+ K on it and when I accelerated hard it immediately went to full boost. With this fix I now have boost readings throughout the guage. I will post some photos of the inside of the actuator and the weld repair once I figue out how to do it. I have now put 200 miles on the repair and so far so good. I hope this helps. My car is 2008 Acura RDX. A week ago 'check emission system' light and 'chck engine'light came on. Went to dealership for check up. Diag code P0237. The technician explained problem with 'wasegate'. Need replacement. cost 4300. Very interested to your solution. but don't know it's applicable in my case. your input is highly appreciated.